I finally got active on Instagram in the last 30 days. As a photographer, that was not a good move on my part to just let Instagram sit on the back burner. There are so many social media choices these days and most of you reading this are probably very active on Facebook but may not have (or make) time for other social platforms. If you enjoy images and/or do a lot of phone photography or regular digital photography, you may want to give Instagram a second thought. 1) Post images and use # hashtags - If you are just starting out with virtually no followers, you should use relevant # hashtags about what you are posting including the name brand. For example, I might post: Image taken with a #Canon #5DMarkIII of my #GoldenRetriever "Tucker." By just using those 3 # hashtags, my image is more likely to be seen. However, those with 1,000+ followers will likely be seen a lot more in general, but even those with lots of followers use # hashtags. 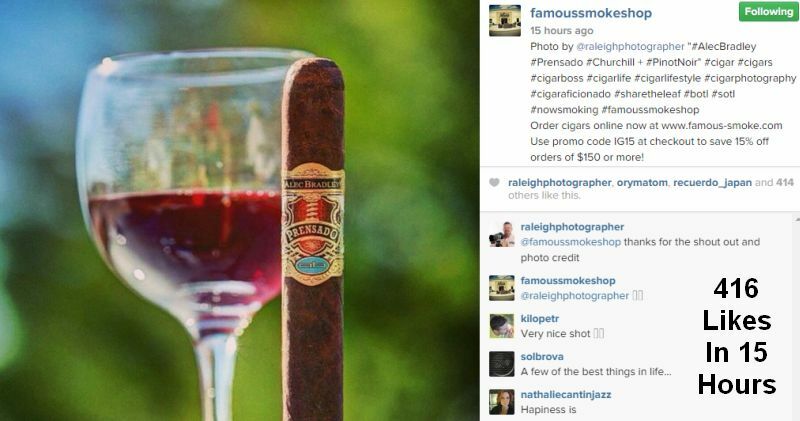 2) Use the @ sign to ping those that you want to give notification to - For example, in the image above @FamousSmokeShop did @raleighphotographer in the post giving me credit on the image (more on the image later) and I got notified. That made it easy for me to know they posted and to be able to thank them for giving me photo credit. There are two core ways for me to get in front of @canonusa on Instagram. (FYI, they have commented on my images numerous times.) That is by # hashtagging like #Canon #TeamCanon #Bringit to name a few and by using @canonusa in my post. I shot the image above in my drive way on a sunny winter day. I first posted it on my feed which @FamousSmokeShop liked. (They follow me and have liked several of my images.) Then, yesterday, they posted the image on their feed and gave me photo credit. 15 hours later, it has 416 likes as of this post ( 1 of the 416 is me). If you have not tried Instagram, you may want to give it a shot. I know that I have really enjoyed it over the last 30 days or so. You can find me on Instagram @raleighphotographer or by clicking this link.